Welcome to Raymond's MSX webpage (ray2day's webpage). This website is about my MSX hobby and collection. Next to that I also try to inform and explain about the MSX system in a simple way. MSX is a homecomputer which was very popular in the eighties and in the beginning of the nineties in Japan and Europe. Produced by almost all large electronica manufacturers (Philips, Sony, Panasonic, Toshiba, Sanyo, Mitsubishi, Casio etc.) it was an attempt of ASCII and Microsoft to come to a standard for computers at that time. Nowadays the MSX system belongs to the retro computers. I am an active user and collector who collects everything which can be obtained regarding MSX and the MSX system. Thank you for visiting my website. I wish you a lot of reading pleasure and I hope you like and enjoy my website! Last update: April 22th 2019 - Hi and welcome to my MSX website! 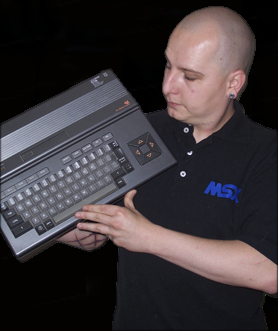 Relax and take a look around and read about the MSX system. - There are a lot of new MSX developments hardeware projects like Rookie Drive from Xavirompe, GR8NET from Eugeny Brychkov, the GFX-NINE from Hans Tillema and the MSXPi. There is also lot of great new software released. - Website: At the moment there is enough information to find about the MSX system on my website, but I'll keep updating. - So please keep on checking this website on new articles about our beloved computer system (soft- and hardware)! !